BEIRUT — Independent investigators were prevented by Syrian and Russian authorities Monday from reaching the scene of an alleged chemical attack near the Syrian capital, an official said, days after the U.S., France and Britain bombarded sites they said were linked to Syria’s chemical weapons program. 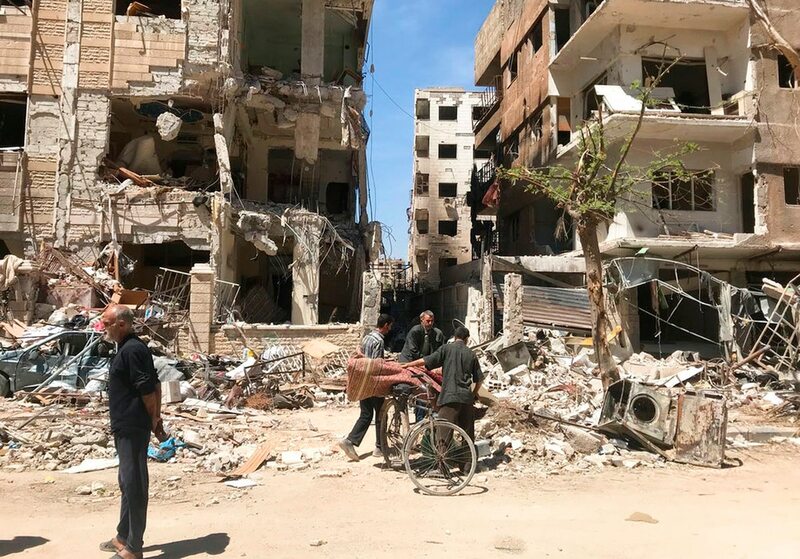 “The team has not yet deployed to Douma,” two days after arriving in Syria, Uzumcu told an executive council of the OPCW in The Hague. President Donald Trump on Sunday defended his use of the phrase “Mission Accomplished” to describe a U.S.-led missile attack on Syria’s chemical weapons program, even as his aides stressed continuing U.S. troop involvement and plans for new economic sanctions against Russia for enabling the government of Bashar Assad. The U.S. and France say they have evidence that poison gas was used in Douma, east of Damascus, killing dozens of people, and that President Bashar Assad’s military was behind it, but they have made none of that evidence public. Syria and its ally Russia deny any such attack took place. “The United Nations has provided the necessary clearances for the OPCW team to go about its work in Douma. We have not denied the team any request for it to go to Douma,” said U.N. spokesman Stephane Dujarric. Syrian opposition and activists have criticized the Russia deployment in the town, saying that evidence of chemical weapons’ use might no longer be found. “I can guarantee that Russia has not tampered with the site,” Lavrov told the BBC in an interview Monday. Syria’s Deputy Foreign Minister Faisal Mekdad has said his country is “fully ready” to cooperate with the OPCW mission. He said government officials met with the delegation, which has been in Damascus for three days, a number of times to discuss cooperation. Meanwhile, NATO’s secretary general said the U.S.-led airstrikes will reduce the Syrian government’s capabilities of carrying out new chemical attacks. Jens Stoltenberg said the strikes were a “clear message” to Assad, Russia and Iran that the use of chemical weapons is not acceptable and that the allies would not stand idle. He spoke in an interview with Turkey’s NTV television on Monday. State TV broadcast the rally live from the central square, where protesters waved Syrian flags in a demonstration that was dubbed a “salute to the achievements of the Arab Syrian Army.” They also set off fireworks and unleashed celebratory gunfire. Shouts of “Allah, Syria, and only Bashar,” a reference to Assad, rang out. White House press secretary Sarah Huckabee Sanders said a decision on new economic sanctions against Russia will be made “in the near future.” U.N. Ambassador Nikki Haley had said a decision was coming Monday for sanctions against Russia for enabling the Assad government to continue using chemical weapons, but the White House did not commit to that timetable. Russian President Vladimir Putin said the military strikes violated the U.N. Charter and that if they continue, “it will inevitably entail chaos in international relations,” according to a Kremlin statement on Sunday. Also Monday, British Prime Minister Theresa May was to face angry lawmakers for authorizing the strikes without a vote in Parliament. Her office said she planned to tell them the strikes were “in Britain’s national interest” and were carried out to stop further suffering from chemical weapons attacks. Vasilyeva reported from Moscow. Associated Press writer Edith M. Lederer at the United Nations and Raf Casert in Luxembourg contributed.